As Grids and service-oriented architectures have evolved to a common infrastructure for providing and consuming services in research and commercial environments, mechanisms are needed to agree on the objectives and the quality of such service provision. There is a clear trend to use electronic contracts between service consumers and one or more service providers, in order to achieve the necessary reliability and commitment from all parties. Service Level Agreements (SLAs) are the means to model and manage such contracts in a unified way. Grids and Service-Oriented Architectures for Service Level Agreements, the thirteenth volume of the CoreGRID series, contains current research and up-to date solutions from research and business communities presented at the IEEE Grid 2009 Workshop on Service Level Agreements in Grids, and the Service Level Agreements in Grids Dagstuhl Seminar 2009. The contributions in this volume cover Grid environments, but also generic models for SLA management that are applicable to service-oriented systems in general, like market-economic strategies, negotiation models, or monitoring infrastructures. 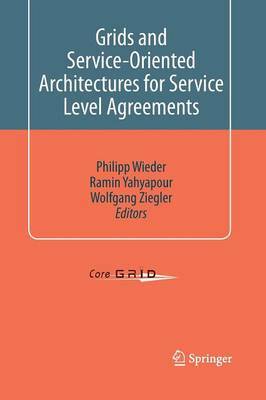 Grids and Service-Oriented Architectures for Service Level Agreements is designed for a professional audience composed of researchers and practitioners within the Grid community industry, and is also suitable for advanced-level students in computer science.